It happened again. I woke up and checked my mental list– Miles, Owen, Toby. Where are they? Are they safe? Can I text them or is it too early? Where are they? Where am I? Are they safe? They are safe. Some day I will lay down forever. Some day. Lay down forever. Some day I will stop everything. I wonder what my last thoughts will be. Death always ends in pain. There will be regrets. There already are. There will be more sorrows and more joys. There will be shadows cast across my life forever. Some day I will lay down forever. I wonder what I would say to myself now if I could go back in time. What would I say to me if I could witness myself and talk to myself in the throes of sorrow, in the impossible reality I feared but never imagined might come true. There is tomorrow and tomorrow and tomorrow, I might say. My ears at the time would hear it as a threat. But I would speak it as a promise because the only hope is the next day. There is a next day and then one after. That is all I can assure you. Some things work like that– you hear it as a promise but it’s actually a threat. Or you hear it as a hope and it is spoken in dread. I think I realized a long time ago that ultimately we are each alone. Such a sad song. It is about a drunk white man beating a black waitress with his cane. She died from the blow and the assailant served only six months in prison. It does not usually take very long for political or topical songs to become dated, but this one does not seem so old, even fifty years later. I think Miles was a kind and fair young man. I wish I had talked to him more about issues and talked to him about how a person can be a positive influence and change the world in big and small ways. I wish I could have had more conversations like that. I wish I could have listened to what he had to say and understand what he thought and why he wanted to do what he wanted to do. I wish I could have listened. I wish I listened more and talked less. I see Miles in my imagination and he never talks. He nods and shrugs and smiles and sits quietly and patiently. But I never hear him talk. I have heard stories of parents who lost their children and their children come to them in dreams and speak to them, kind and soothing reassuring words. But when I see Miles he is quiet and that is fine. It is nice just to see him. I see him for real in a way, forever 17 and peaceful and understanding. Dylan can cut his women down to size. He is often mean in his songs about women. I don’t know of many generous or affectionate love songs by Dylan, but “Sara” is a little more generous than usual. She is mysterious and elusive and this Sara seems to hold the upper hand. She has more agency and power than a typical Dylan creation. I like some of the classical references in this song such as “Sara, oh Sara / Glamorous nymph with an arrow and bow / Sara, oh Sara / Don’t ever leave me, don’t ever go.” Such allusions can come off as leaden and forced, but these work. Recently, I have been reminded by a friend of many characters from Greek and Roman literature. Daedalus, who survived his son Icarus. Icarus flew too high and too long, too close to the sun. Daedalus survived, unnaturally living beyond the younger one’s years. I know Miles in his photography understood allusions and references. We went to the Midtown Scholar bookstore in Harrisburg one day. It is a great bookstore with a large art and photography section. Miles browsed mightily on our trips there. He would get a stack of photography books and look hungrily through them. One time while I was sitting with my tea at a high table, he brought two books to me. One was a William Eggleston book. The other was of the work of a photographer from the generation after Eggleston. 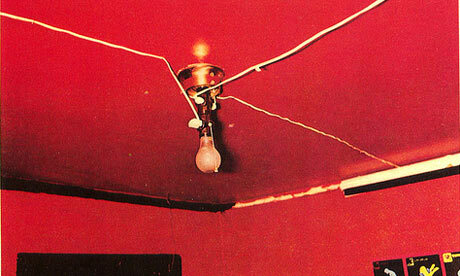 Miles showed me two pictures from the books–one Eggleston photograph of a light bulb on the ceiling of a bright red room. The other photograph was similar. It was a light bulb, starkly lit in a bright room. I don’t remember the second book. I just remember Miles’s enthusiasm. Miles explained to me that the second photograph was reminiscent of the Eggleston photograph and that the photographer was making a reference to Eggleston in his own work. It was not obvious to me, but as he explained to me the compositions and the timing and he influence of Eggleston on photography, it became clear to me that he was correct. I was very proud of him. This is one of those Dylan songs that is so simple in its structure, but overflowing with so many good lines. It’s an aphoristic delight, a biting portrait of a poor immigrant, poor in his spirit.